Your pet was and still is close to your heart. Now that s/he has passed away, you want to see her/him again in the form of anything! Why not create a beautiful sculpture of her/him? You need not create a heavy stone or metal sculpture. It can be created even with a delicate and lightweight material like wool. No one can believe that a material like wool can be made into sculptures, but it’s true. Different colored wools can be felted together and these sculptures can be created. They are lightweight and you can move them anywhere, and place on your work table, mantelshelf, window or anywhere you want. Being woolen, it can accompany you at bedtime too, so as to give you a feel of being near your beloved pet. You can cuddle it and shower it with your love as if it were your pet. Wear it on your hand and it will exactly look like your pet with its full character, portrayed by the outstanding talent of the artist. More than a two-dimensional photo of your pet, this three-dimensional sculpture will give you a sense of your pet being near you. Where can You Get a Felt Art Sculpture? 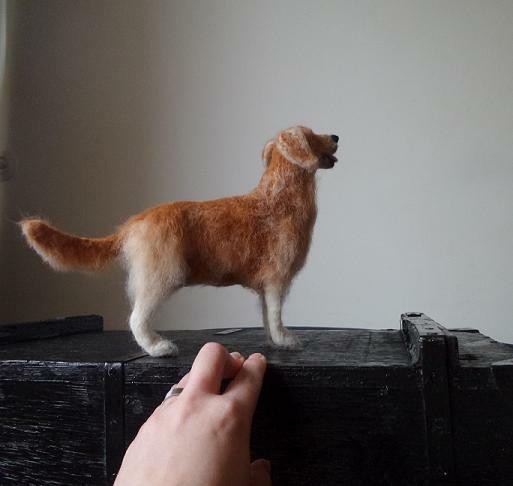 Shima Fiber Art can produce these exclusive felt wool statues for you. These are some of the most delicate and lovable keepsakes that will be an immortal memory of your pet. 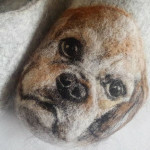 You just have to send her the photos of your pet and she will transform your pet as a beautiful keepsake that will represent your pet’s personality and character. She uses 100% organic wool of highest quality for creating these art pieces. If you see some of her art pieces, you will realize her high level talent and skill in making these exquisite sculptures. Some of them have been given in this article and you can see many more on her website. So, if you want something really heartwarming as your pet’s memory, go for these felt art sculptures and you will get the sense of your pet being always near you.